The third category in this list is dedicated to, coincidentally enough, Third Person Shooters. Countless games have utilized this camera perspective to build their game mechanics around, while still focusing on their main protagonist. Going as far back as Mario 64 or Zelda, to Prince of Persia and Tomb Raider, even Metal Gear Solid and Grand Theft Auto. For this list, however, I have chosen games that primarily feature shooting as the defining mechanic, as I have a fourth and fifth category for platformers and story. Some developers have done it well, others haven’t. Developers like EPIC Games, who made Gears of War for example, redefined 3rd Person Shooters by implementing a quick and seamless cover mechanic, and single-handedly moved Xbox 360s. Grand Theft Auto made the jump to 3rd person with its third iteration, and rocketed the entire franchise to the lofty house-hold name it is today (for better or for worse, in some views). Some games even tried to meld the two like the Tom Clancy Rainbow Six Vegas series. Be it exploration or shooting, platforming or melee, you’ll find a title that suits your need. For this category I had the hardest choices and sacrifices to make, but I chose: Spec Ops: The Line, Dead Space, and Gears of War. Spec Ops: The Line is understatedly fantastic, and barely anyone seems to know about it, or has played it. It’s a game that remained under the radar, and was released without much fan-fare. But the reviewers out there loved it. Even myself, I only played it a year after it had been out. That’s not really saying a lot though, since I am slow to get to games. 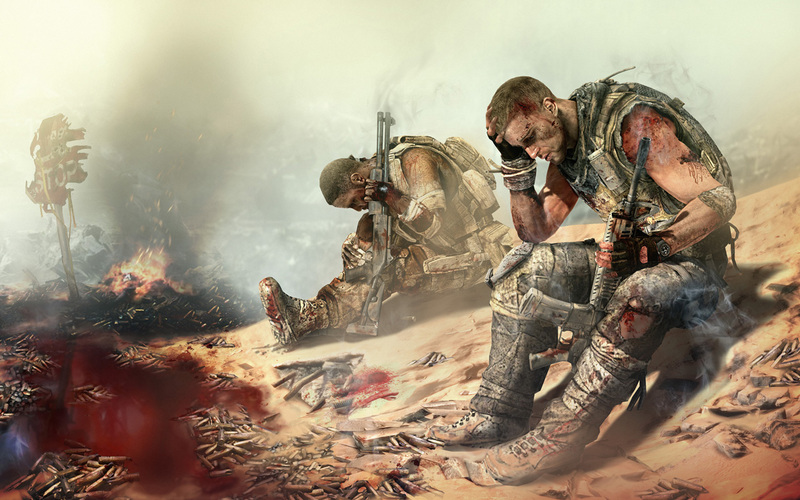 Spec Ops: The Line is the Apocalypse Now of video games. It’s a war story with no happy endings, with terrible atrocities, and a game that’ll make you feel just terrible when you’re through. Why do I suggest it then, you ask? I answer your question with a question. When was the last time a game made you feel anything? Happy? Sad? Exhilaration, maybe. Stressed or scared? Sure. What about grief or disgust? Regret? Has Call of Duty ever made you think twice about the people that you’re slaughtering? Spec Ops does. Is it maybe the innocuous title, that made people overlook it? The true horrors of what men can do are put on display, and it’s not a pretty picture. As the “hero”, we’re dropped into the deserts of Dubai, after most of the city has been wiped out by sand storms and war. We’re here because a distress beacon brought us here. Former military teams thought lost have called home, and we’re here to get them. But things go sideways as they always do, and we find ourselves on foot with our small team, trekking across the sand city to find them. A long the way we come across bandit teams, and former soldiers gone rogue or gone mad. We come across small civilian groupings scrounging for food and water. The game, and our “headset” commander, asks us to destroy certain points of interests, or groupings of enemies ahead with a little weapon called white phosphorous. And we play along, as the good soldier would, following commands. But then the game begs the question: Why did you just do that? As we then have to trudge through the smoking, screaming humanity. Was that really our only option? Were you sure those were even soldiers? The mechanics of the game are like Gears of War. 3rd person view – obviously – with chest high cover. It’s the same game engine after all. And the level of destruction is a key point to mention, as certain destructible walls will unleash a wave of sand, taking out nearby enemies. This game IS my #1 game of last generation, and would have almost been better served in the Story category, due to the lasting, haunting feelings. But it’s here, to kick off this one instead, and close out this week. Come Backwards Compatibility, I will re-play this game, and will do it better justice with a full Review, as I don’t think I really can in this format. This entry was posted in Feature, Reviews and tagged Games, Gaming, Spec Ops The Line, Top 10, Video Games, Xbox, xbox 360. Bookmark the permalink.